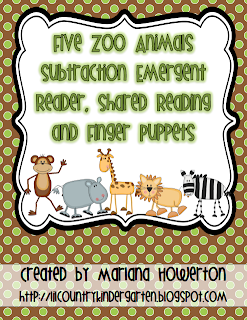 Lil Country Librarian: Zoo Animals Shared Reading, Emergent Reader, Finger Puppets and More! Zoo Animals Shared Reading, Emergent Reader, Finger Puppets and More! This is the first year that we have planned not to take our Kindergarten students to the zoo. Every year it seems like we battle with the weather and it's so unpredictable that it was easier to go with an indoor field trip this year and not have to worry about rescheduling. I'm really looking forward to our new destination (a science and discovery center), but I will definitely miss the zoo. However, we were lucky enough to still get to teach a unit on zoo animals! 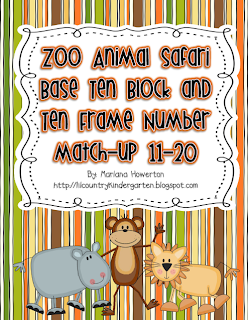 I have a created a few resources to go along with ELA and Math that still incorporate zoo animals into Shared Reading and Math Work Stations. Be sure to check them out in the next few days while they are on sale! Click on the pictures below to take you to my TpT store. 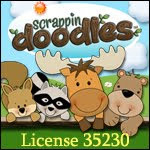 They would also go great with my zoo animal hundreds charts like the lion and monkey! *On sale through Tuesday, April 30, 2013. I love your animals unit. I don't currently do a zoo animals unit, but I would love to loop it into my farm unit at the beginning of the year! I'll see you on TPT! Thank you so much, Kirstin! You should integrate both if you have time. My kids LOVE zoo animals and they retain so much of the knowledge they learn about each animal. It's lots of fun!